This entry was posted in Elections 2012, Mitt Romney, Politics: National and tagged Barack Obama, Debates, Gallup, Libya. Bookmark the permalink. It seems like more than in the past, people have their own poll or other tool to convince themselves that their guy is going to win. Like with a lot of things there are many too choose from now, so you can pick the poll you like. 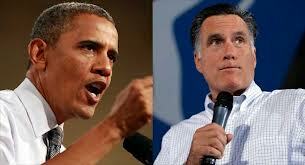 I have this gut feeling that things are breaking toward Romney, though I don’t think I’ll vote for him. I’m not sure it will elect him though. It seems like more than in the past, people have their own poll or other tool to convince themselves that their guy is going to win. Whatever happens I’ve especially enjoy pummeling the left using Gallop. All the liberals ever do is castigate Rasmussen as a tool of the right. I wonder if this hurricane could have an effect to. The Hurricane could affect the voter turnout in that it is a distraction . The side whose voters are not as passionate will have a harder time keeping them motivated to actually take the time to show up . If everyone is thinking about the aftermath of Frankenstorm they are not thinking election . Turnout is everything to each side .